← Mugwort: John the Baptist’s Girdle? Arthur Waite also provides some helpful commentary on the meaning of the Hermit. He says it blends the ideas of the Ancient of Days (a Hebrew name for the Divine) with the Light of the World (a title Jesus used to describe himself). 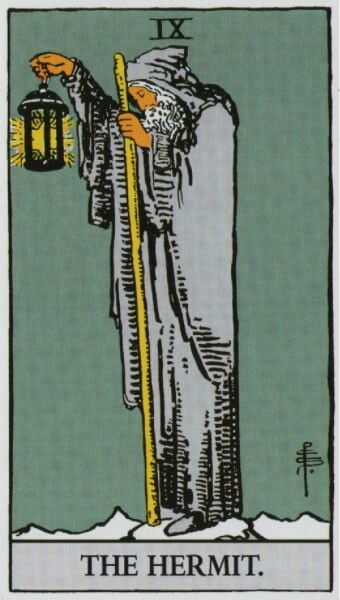 Waite also warns about misinterpreting this card, saying, it is not “a wise man in search of truth and justice; nor is he…an especial example of experience. His beacon intimates that ‘where I am, you also may be. '” I take this to mean that we can never really grasp the Ultimate Truth. Instead we draw near it as we draw near to the Divine. For me this card tells us it’s time to be very quiet and try to listen to the voices of the Ancient Ones/Divine Presence and the wisdom they can impart to us. It’s not a time for decision-making but is a time to withdraw from the distractions of life until the way forward is clear. 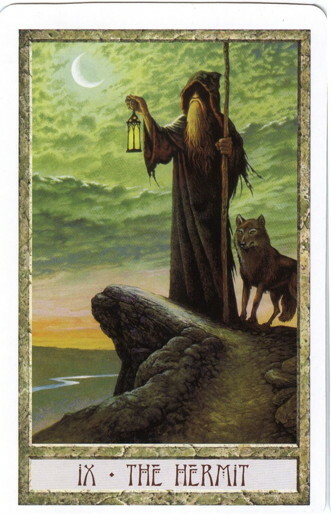 This entry was posted in Tarot and tagged Tarot, The Hermit. Bookmark the permalink.